If you feel like you have been missing out on some valuable information in your Google Analytics, you’re in luck. 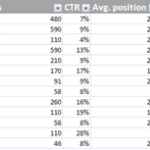 Most of it has probably been hiding in Google Webmaster Tools all along, waiting for you to unlock it! Not to mention with Google+ Review, there is more data available than ever before. If you haven’t already setup your site on Google Webmaster Tools, be sure to do it now! You will need a Google Account which you probably already have if you are using Google Analytics, Gmail, Feedburner, or any other Google service. 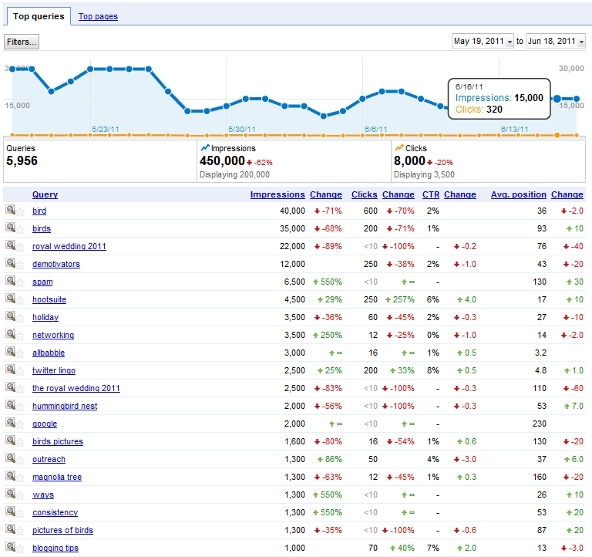 All you need to do is go to your Google Webmaster Tools dashboard and add your site. To verify you are the owner, you will have to upload a simple HTML file to your root domain server or add a META tag to your site’s header (the latter is much simpler). The other thing you will want to do is submit a sitemap under the Site Configuration menu on the left side once your site is verified. If you have a self-hosted WordPress site, you can easily create a sitemap using the Google XML Sitemaps plugin. Alternatively, you can use sites like XML-Sitemaps.com to generate one. Once your site is setup and pulling data, you can get the following information all in one place! Does your site have additional links in the search results? You can’t fully control these, but you can at least remove unwanted options from your Site Configuration > Sitelinks. 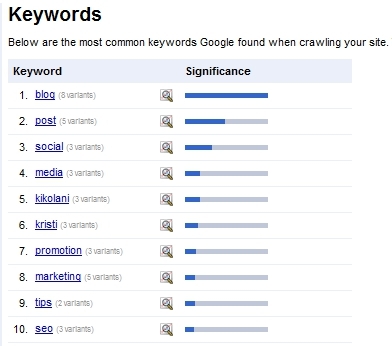 Sure, Google Analytics tells you what search terms brought people to your site. But don’t you want to know more about those terms? Under Your Site on the Web > Search Queries, you can view the following. You can see everything from your average position for a search term to how many impressions vs. how many clicks you receive for a particular term. You’ll see quickly when you’re ranking for terms that don’t make sense, and which terms you should go after as ranking higher will result in more targeted traffic. Links to Your Site, also under Your Site on the Web will show you the top 1,000 domains linking to your site and how many pages from their site link to yours. Next under Your Site on the Web is Keywords. This section tells you what Google thinks your site is about. If the keywords are not accurate, you may want to look at your on-site optimization and content to make sure you are targeting the right keywords. Want to make sure your site is virus-free? Under Diagnostics > Malware, you (hopefully) will have an all clear message. Webmaster Tools will also alert the email address on file if there are any malicious programs setting up show on your website. The last thing you want when someone clicks on a link to your site is for them to arrive to a 404 page not found error. While you may have a great 404 page, you want it to be discovered as few times as possible. Use the Diagnostics > Crawl Errors portion of Webmaster Tools and review your Not Found pages. Not at all – there is a lot more valuable information about your website in Google Webmaster Tools – these are just the ones that are the most valuable. Be sure to add your site and discover more information to help you in optimize your site for the best performance in search and on the web!